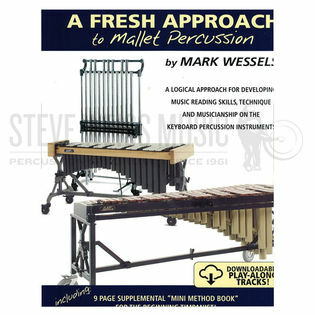 Mark Wessels' book A Fresh Approach to Mallet Percussion presents a logical approach for developing music reading skills, technique and musicianship on the keyboard percussion instruments. In addition to over 90 pages of great reading studies, this book also includes a nine page supplemental "mini-book" for timpani - complete with instructions on the common techniques, exercises and solos for the beginning timpanist. 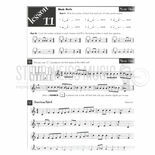 Just plug the link in on your computer and you'll have access to an all new SPEED NOTE READING TUTOR VIDEO GAME – designed to help the beginning percussion develop great music reading skills – PLUS 18 video lessons for the beginning timpanist, PLUS over 50 pages of additional sightreading material. The online audio is recorded with and without the solo part for playing along. Quick ship, just what we ordered. i used this book in 6th grade and it helped me very well in reading notes and proper technique for mallet percussion. This book starts off with a simple demonstration on how to hold the mallet and finding notes at the end you'll find yourself playing difficult solos you didn't think you once could. I suggest going over your major and minor scales everyday once learned. This book is highly recommended.